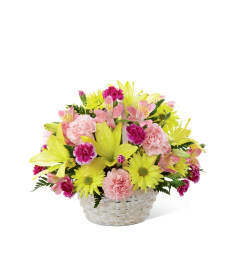 The FTD® Uplifting Moments™ Basket is a guaranteed way to lift any mood and spread cheer with each sunlit petal! 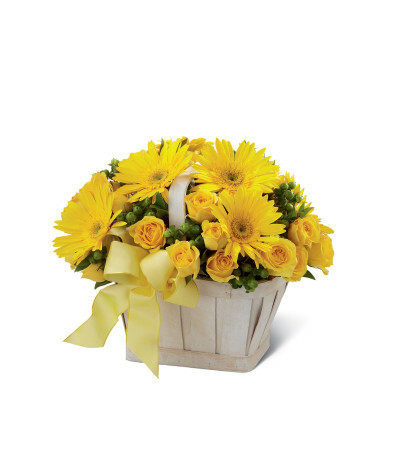 Bright yellow gerbera daisies and spray roses burst with vibrant energy arranged amongst green hypericum berries and myrtle greens in a simply stylish whitewash basket. 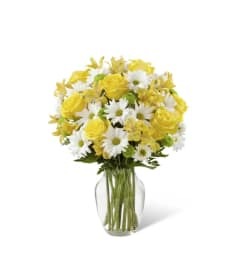 Bedecked with a lemon yellow wired ribbon this bouquet proclaims an abundance of light and hope.